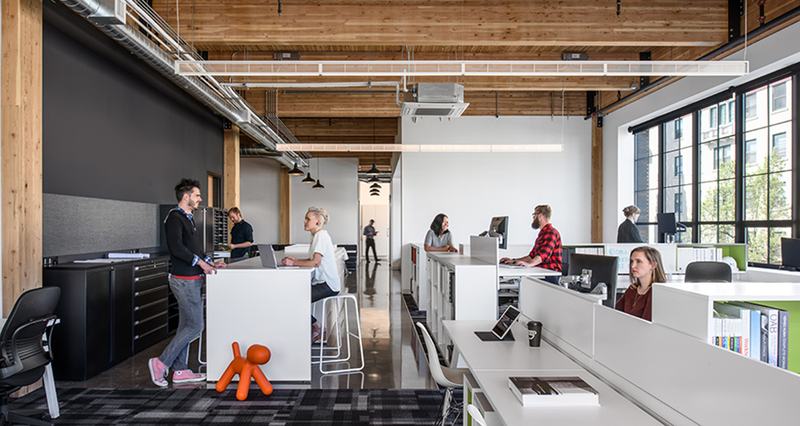 Mackenzie’s Vancouver office, in the newly constructed Hudson Building (also designed by Mackenzie), serves as an example of our workplace design strategy, which focuses on employee wellbeing and engagement. 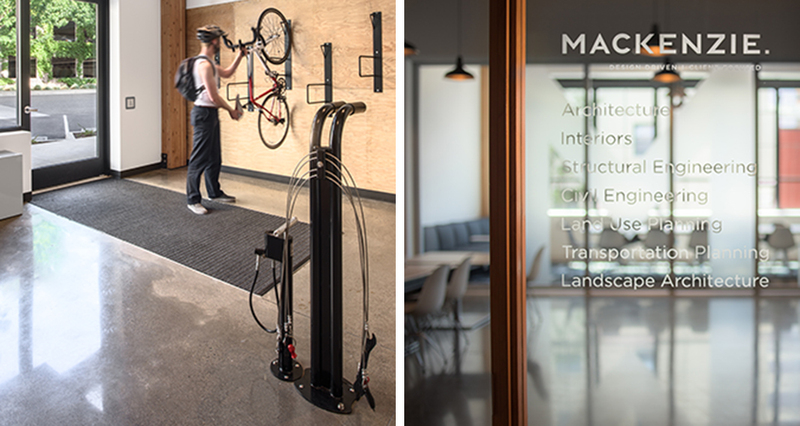 The design seeks to support Mackenzie’s evolving culture while also providing an immersive example of our work to our clients. 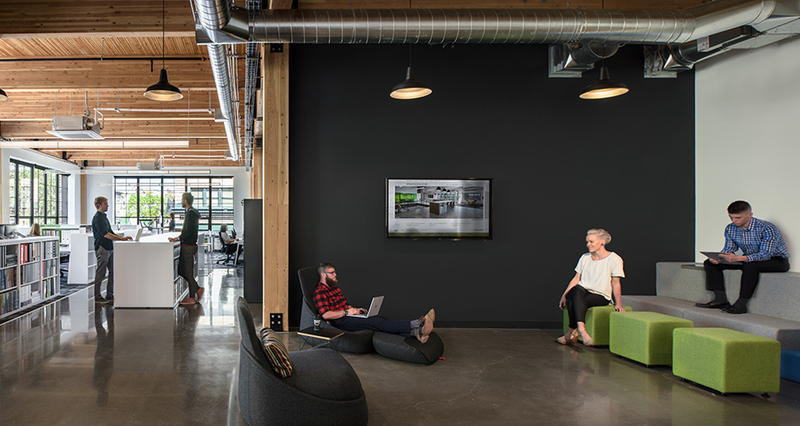 • Fostering a sense of community through the design of a centrally located “living room” that supports collaboration. The 2,957 SF space was the most limiting factor for an office that needs to provide a productive work environment for 30+ creatives. The space needed to accommodate multiple collaborative and focused areas (a blend of assigned and unassigned spaces), and a large meeting area for 40+ people for monthly presentations and community meetings. 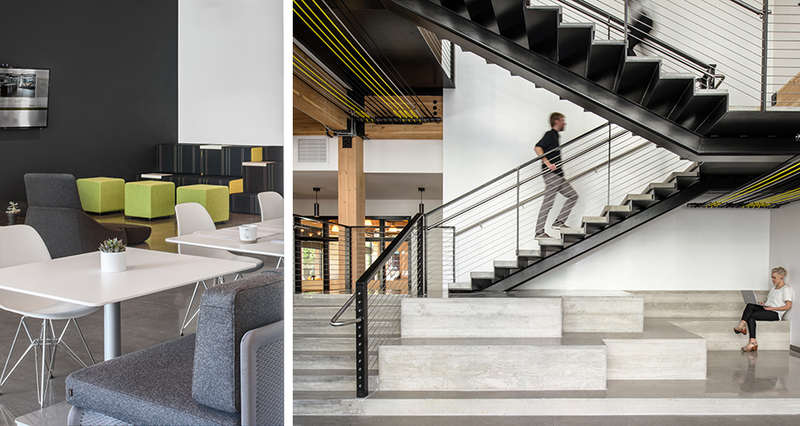 We achieved this by providing several types of workstations, and designing a large flexible community space that efficiently fulfills multiple purposes that traditionally would be separated: a reception area, break room, and collaborative area. This flexible area is adjacent to a conference room that opens into it, strategically providing additional space when needed. Sustainable design was another key project goal. Four Green Globes (the highest possible) have already been awarded through GBI’s Sustainable Interiors program, and Mackenzie has been registered as a Clark County Green Business. Sustainable elements include an efficient variable refrigerant flow system, high-performance window glazing, and combinations of LED and natural daylighting.